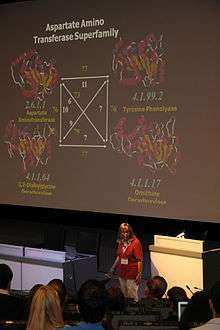 Janet Thornton at the UniProt symposium, a satellite event to ECCB 2012 in Basel, giving a talk on molecular evolution. The European Conference on Computational Biology (ECCB) is a scientific meeting on the subjects of bioinformatics and computational biology. It covers a wide spectrum of disciplines, including bioinformatics, computational biology, genomics, computational structural biology, and systems biology. ECCB is organized annually in different European cities. Since 2007, the conference has been held jointly with Intelligent Systems for Molecular Biology (ISMB) every second year. The conference also hosts the European ISCB Student Council Symposium. The proceedings of the conference are published by the journal Bioinformatics. ECCB was formed with the intent of providing a European conference focusing on advances in computational biology and their application to problems in molecular biology. The conference was initially to be held on a rotating basis, with the idea that previously successful regional conferences (for instance, the German Conference on Bioinformatics (GCB), the French Journées Ouvertes Biologie, Informatique et Mathématiques (JOBIM) conference and the British Genes, Proteins & Computers (GPC) conference) would be jointly held with ECCB if that region was hosting ECCB in that particular year. The first ECCB conference was held in October 2002 in Saarbrücken, Germany and was chaired by Hans-Peter Lenhof. 69 scientific papers were submitted to the conference. In 2004, ECCB was jointly held with the Intelligent Systems for Molecular Biology (ISMB) conference for the first time. It was also co-located with the Genes, Proteins & Computers conference. This meeting, held in Glasgow, UK, was the largest bioinformatics conference ever held, attended by 2,136 delegates, submitting 496 scientific papers. ISCB Board member and Director of the Spanish National Bioinformatics Institute Alfonso Valencia considers ISMB/ECCB 2004 to be an important milestone in the history of ISMB: "it was the first one where the balance between Europe and the States became an important part of the conference. It was here that we established the rules and the ways and the spirit of collaboration between the Americans and the Europeans." The success of the joint conference paved the way for future European ISMB meetings to be held jointly with ECCB. In January 2007, ISMB and ECCB agreed to hold joint conferences in Europe every other year, beginning with ISMB/ECCB 2007. This pattern has been confirmed to continue until at least 2017. ISMB/ECCB 2011 Vienna, Austria Vienna International Centre Burkhard Rost, Michal Linial, Peter Schuster, Kurt Zatloukal; 10th annual ECCB conference. ↑ Rost, B.; Gaasterland, T.; Lengauer, T.; Linial, M.; Markel, S.; Morrison McKay, B.J. ; Schneider, R.; Horton, P.; Kelso, J. (13 July 2012). "Paving the future: finding suitable ISMB venues". Bioinformatics. 28 (19): 2556–2559. doi:10.1093/bioinformatics/bts420. ↑ "Homepage". European Student Council Symposium. Archived from the original on September 8, 2012. Retrieved September 8, 2012. ↑ Abeel, T.; De Ridder, J.; Peixoto, L. (2009). "Highlights from the 5th International Society for Computational Biology Student Council Symposium at the 17th Annual International Conference on Intelligent Systems for Molecular Biology and the 8th European Conference on Computational Biology". BMC Bioinformatics. 10: I1. doi:10.1186/1471-2105-10-S13-I1. PMC 2764124 . PMID 19840405. 1 2 Lengauer, T. (1 April 2002). "Editorial". Bioinformatics. 18 (Suppl 2): S1–S1. doi:10.1093/bioinformatics/18.suppl_2.S1. ↑ Lenhof, H.-P.; Sagot, M.-F. (8 October 2003). "ECCB 2003". Bioinformatics. 19 (Suppl 2): ii1–ii2. doi:10.1093/bioinformatics/btg1051. ↑ "ECCB 2002 Organization". Bioinformatics. 18 (Suppl 2): S2–S3. 1 April 2002. doi:10.1093/bioinformatics/18.suppl_2.S2. ↑ "History of ISCB". www.iscb.org. Retrieved 19 September 2013. ↑ "ISMB/ECCB 2004". ISMB/ECCB 2004. Retrieved 19 September 2013. ↑ Gibson, Todd A. "The Roots of Bioinformatics in ISMB". PLoS Computational Biology. 8 (8): e1002679. doi:10.1371/journal.pcbi.1002679. ↑ Linial, M.; Mesirov, J. P.; Morrison Mckay, B. J.; Rost, B. (2008). "ISMB 2008 Toronto". PLoS Computational Biology. 4 (6): e1000094. doi:10.1371/journal.pcbi.1000094. PMC 2427177 . PMID 18584023. 1 2 "ISCB Newsletter - Summer 2014 - Volume 17, Issue 2" (PDF). ISCB. Retrieved 8 August 2014. ↑ "Proceedings of the European Conference on Computational Biology (ECCB 2002)". Bioinformatics. 18 (Suppl 2): S1–S259. April 2002. Retrieved 12 February 2014. ↑ "Proceedings of the European Conference on Computational Biology (ECCB 2003)". Bioinformatics. 19 (suppl 2): ii1–ii255. 27 September 2003. Retrieved 12 February 2014. ↑ "Proceedings Twelfth International Conference on Intelligent Systems for Molecular Biology/Third European Conference on Computational Biology 2004 Glasgow, UK July 31-August 4, 2004". Bioinformatics. 20 (Suppl 1): i1–i395. 4 Aug 2004. Retrieved 3 October 2013. ↑ "ECCB/JBI'05 PROCEEDINGS. Fourth European Conference on Computational Biology/Sixth Meeting of the Spanish Bioinformatics Network (Jornadas de BioInformática), Palacio de Congresos, Madrid, Spain, September 28-October 1, 2005". Bioinformatics. 21 (suppl 2): ii1–ii269. doi:10.1093/bioinformatics/bti1145. Retrieved 12 February 2014. ↑ "ECCB 2006 CONFERENCE PROCEEDINGS, JANUARY 21-24, EILAT, ISRAEL". Bioinformatics. 23 (2): e1–e244. 15 January 2007. doi:10.1093/bioinformatics/btl631. Retrieved 12 February 2014. ↑ "ISMB/ECCB 2007 CONFERENCE PROCEEDINGS 21–25 JULY 2007, VIENNA". Bioinformatics. 23 (13): i1–i586. 13 July 2007. doi:10.1093/bioinformatics/btm285. Retrieved 3 October 2013. ↑ "ECCB 2008 CONFERENCE PROCEEDINGS 22-26 SEPTEMBER 2008, CAGLIARI, ITALY". Bioinformatics. 24 (16): i1–i255. 15 August 2008. doi:10.1093/bioinformatics/btn377. PMC 2718667 . PMID 18689809. Retrieved 12 February 2014. ↑ "ISMB/ECCB 2009 CONFERENCE PROCEEDINGS JUNE 27 TO JULY 2, 2009, STOCKHOLM, SWEDEN". Bioinformatics. 25 (12): i1–i384. 15 June 2009. Retrieved 3 October 2013. ↑ "ECCB 2010 CONFERENCE PROCEEDINGS SEPTEMBER 26 TO SEPTEMBER 29, 2010, GHENT, BELGIUM". Bioinformatics. 26 (18): i409–i667. 15 September 2010. doi:10.1093/bioinformatics/btq499. Retrieved 12 February 2014. ↑ "ISMB/ECCB 2011 PROCEEDINGS PAPERS COMMITTEE JULY 17 TO JULY 19, 2011, VIENNA, AUSTRIA". Bioinformatics. 27 (13): i1–i411. 1 July 2011. doi:10.1093/bioinformatics/btr298. Retrieved 3 October 2013. ↑ "ECCB 2012 PROCEEDINGS PAPERS COMMITTEE SEPTEMBER 9 TO SEPTEMBER 12, 2012, CONFERENCE CENTER BASEL, SWITZERLAND". Bioinformatics. 28 (18): i303–i648. 15 September 2012. doi:10.1093/bioinformatics/bts490. Retrieved 12 February 2014. ↑ "ISMB/ECCB 2013 PROCEEDINGS PAPERS COMMITTEE JULY 21 TO JULY 23, 2013, BERLIN, GERMANY". Bioinformatics. 29 (13): i1–i371. 1 July 2013. doi:10.1093/bioinformatics/btt281. Retrieved 3 October 2013. ↑ Devignes, MD; Moreau, Y (1 September 2014). "ECCB 2014: The 13th European Conference on Computational Biology.". Bioinformatics (Oxford, England). 30 (17): i345–8. doi:10.1093/bioinformatics/btu512. PMID 25161218. ↑ "ISMB/ECCB 2015 PROCEEDINGS PAPERS COMMITTEE JULY 10 TO JULY 14, 2015, DUBLIN, IRELAND". Bioinformatics. 31 (12): i1–i2. 15 June 2015. doi:10.1093/bioinformatics/btv303. Retrieved 6 November 2015. ↑ "Dutch Techcentre for Life Sciences". Retrieved 19 June 2015. Wikimedia Commons has media related to European Conference on Computational Biology.